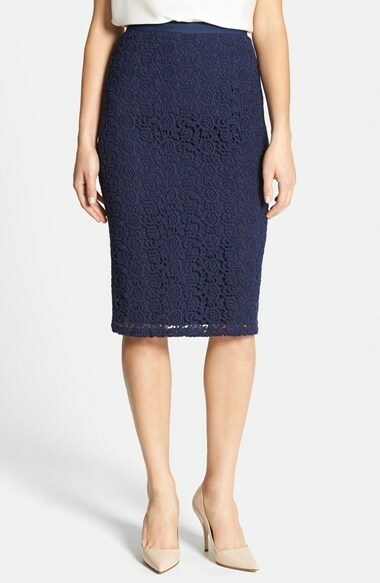 If you're looking for a casual yet absolutely stylish getup, consider wearing a navy print crew-neck sweater and a Classiques Entier camellia lace pencil skirt. These two items are very comfortable and look amazing paired together. Sporting a pair of black leather pumps is an easy way to add some flair to your look. 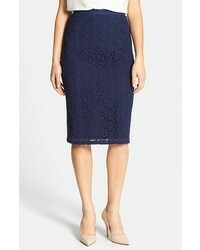 If you're looking for a casual yet absolutely stylish ensemble, try teaming a navy blazer with a Classiques Entier camellia lace pencil skirt from Nordstrom. Both garments are super comfortable and they also look stunning together. 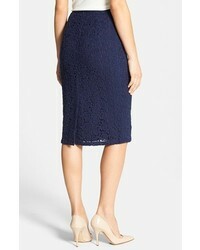 Round off this outfit with navy suede pumps. If you're in search of a casual yet seriously stylish getup, make a mustard crew-neck sweater and a Classiques Entier camellia lace pencil skirt your outfit choice. Both of these pieces are totally comfortable and look great paired together. You could perhaps get a little creative when it comes to footwear and lift up your ensemble with brown leather pumps. If you're scouting for a casual yet absolutely stylish look, pair a grey crew-neck t-shirt with a Classiques Entier camellia lace pencil skirt. As well as totally comfy, both pieces look amazing when paired together. Got bored with this ensemble? Enter black and white leather pumps to change things up a bit. If you're after a casual yet seriously chic outfit, make a white crew-neck sweater and a Classiques Entier camellia lace pencil skirt your outfit choice. Both pieces are very comfortable and will look great when paired together. Make your getup more fun by rounding off with tan canvas low top sneakers. 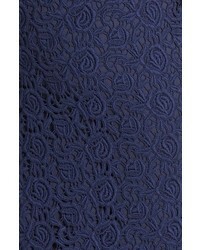 If you're hunting for a casual yet incredibly chic outfit, pair a grey hoodie with a navy lace pencil skirt. These two garments are very comfy and will look great together. Throw in a pair of navy canvas high top sneakers to have some fun with things.